When purchasing a Garden Building, we recommend you choose the best quality that you can afford. It is often a false economy to opt for a cheaper option, when you end up having to replace it prematurely or spend a considerable amount maintaining its upkeep. We firmly believe in delivering great value through using only the finest quality materials, making your garden building a long-lasting lifestyle investment. Is delivery included as part of the price? Are you going to have to spend time building a base and putting up a flat-pack shed that is delivered in kit form? Every one of our buildings is delivered and installed free of charge as part of our end to end service. Our team of specialist installers will make sure that the building is in perfect condition prior to leaving your property, so you can sit back and relax while our team does all the hard work. When you are purchasing what could essentially become an extension of your home, you certainly want to trust the company handling it. Are they experienced in bespoke construction? Are they listening to your thoughts and opinions? The right company will have a longstanding history of providing quality garden buildings, not to mention a team of friendly, reliable and knowledgeable professionals. Heavy duty timber is essential for the longevity and strength of your building. Many sheds are constructed with a larchlap cladding. This may offer people good value for money, but as a low cost option is it not likely to last beyond a couple of years. Look for a shed that uses red wood pine rather than white wood spruce, as it is less susceptible to knots falling out. We use sustainable FSC® certified timber and we take our environmental responsibilities very seriously. You can read more about how we reduce our impact on the planet in our Environmental Policy. A solid, professionally-laid concrete base is the ideal surface for a garden building. Paving slabs are also an acceptable alternative for smaller buildings. Read more about concrete bases in our related article, To Concrete or Not to Concrete. For a strong and durable floor, we recommend 19 x 125mm, tongue and groove floorboards set on 38 x 75 mm tanalised planed floor joists set at no more than 450mm (from the centre of the floor joists) apart. Man-made boards used on inferior sheds bend, bow and prematurely rot. We also provide our customers the option to have their floor insulated, especially if they intend to spend a lot of time in their garden building. Joinery-made windows are stronger are far less likely to leak than their equivalent. Toughened glass is far less likely to break and if it should ever break, it breaks safely; this makes it a definite addition if children are present. You should also consider whether you want the ability to open your windows, especially in the warmer months. Doors that are joinery-made are stronger and will be made specifically for your building and as a minimum, we recommend framework of 75 x 75mm planed. Being able to choose which way you would like your door hung, or having door options such as a double or glazed door, is always desirable. A deteriorating roof is one of the first signs of an inferior shed, so you should opt for a strong construction. We recommend 19 x 125mm tongue and groove board on 38 x 75mm frame. This should be covered with a heavy duty felt, such as 35kg mineralised roofing felt. Other options for a roof are cedar shingles or roof tiles, which are both visually appealing and able to further promote the longevity of the roof. A green, sedum roof can also be attractive and of course promotes the ecology and natural climate control of your shed. The paint finish is one of the most noticeable, and therefore important, aspects of your shed's exterior. Make sure you get a colour that complements the style of your garden. A better quality paint finish drastically reduces the need for upkeep. 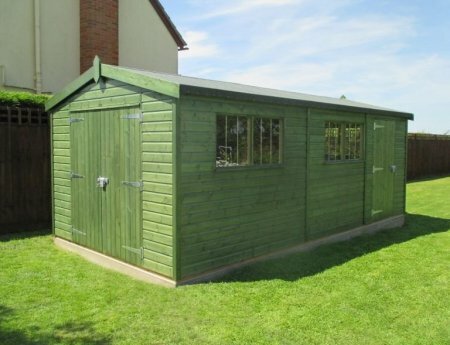 Make sure that your shed has been treated with a preservative to guard against fungi and woodworm. We offer a number of different paint options including Farrow & Ball, Valtti & Sikkens which offer superior protection against the elements. Sheds are often used to store items that are of value. Therefore, security should always be a concern. Our Security Pack addresses this need, with features include security bars, a heavy-duty anti-pick lock and non-returnable screws around the door hinges. 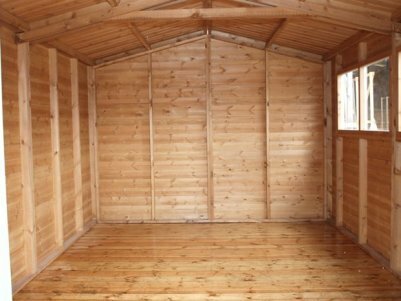 Hopefully we've outlined all the importance of all the things you would consider when purchasing a garden shed. You can also always visit one of our seven UK Show Centres, where a friendly member of the team will be more than happy to discuss your requirements with you. Alternatively, you can Request a Callback, Contact Us or call us directly on 01760 444229, we will always be on hand to offer guidance and assistance.